Daisy Luther lives in a small village in the Pacific Northwestern area of the United States. She is the author of The Organic Canner, The Pantry Primer: A Prepper’s Guide to Whole Food on a Half-Price Budget, and the soon-to-be-released The Prepper’s Water Survival Guide: Harvest, Treat, and Store Your Most Vital Resource. 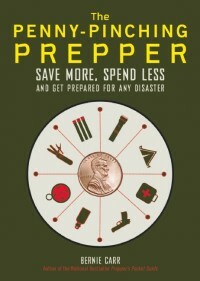 On her website, The Organic Prepper, Daisy uses her background in alternative journalism to provide a unique perspective on health and preparedness, and offers a path of rational anarchy against a system that will leave us broke, unhealthy, and enslaved if we comply. Daisy’s articles are widely republished throughout alternative media. You can follow her on Facebook, Pinterest, and Twitter. This is for the original author. not the AP Blogger. …those 2 way radios will transmit @ 1/2 a mile….thats it. Over water….maybe 2-3 miles. You do Not need a license to LISTEN on a Ham radio….only to transmit. Also….you do NOT need a license to transmit if you are looking to save a human life…. ie. a true emergency. Thanks for pointing that out Bill G.
Great advise if you live in a mall village in the country, but seriously? The focus of this website is for people who live in apartments, often in large cities, where most people don’t have space for an extra jug of water, never mind a whole room. Not all apartment come with master suites that include an adjoining bath, either. And many apartment management companies don’t allow you to paint, let alone build a little room inside your unit. Good ideas if you own your own home, but not really relevant to the intended audience. Sorry.